Cambrian Mountains SocietyThe Cambrian Mountains are remote and sparsely-populated, and yet contain some of the most beautiful, colourful and varied landscapes in southern Britain. Standing stones and cairns remain in scenery that is still largely undeveloped since its prehistoric past. The Cambrian Mountains Society exists to try to protect and preserve this ancient landscape. StarLightComputer software that will bring up on your screen sky maps for any time in the past and from anywhere in the world. Designed for teaching and practising Visual Astrology and especially the use of stars in astrological interpretation, but also excellent for examining the horizons and skies above prehistoric sites. Ouroboros TrustWisdom of the AncientsThe Ouroboros Research and Education Trust is dedicated to restoring an appreciation of Ancient and Indigenous Wisdom Studies (AIWS) as a significant factor in the global call for more wisdom-based cultures. We invite you to explore our site and to learn about the work of researchers and organisations from around the world. Callanish Web CamBrilliant idea set up to share the skimming of the moon along the horizon at the last Major Lunar Standstill. Archaeoastronomy from the warmth and comfort of your home!See also Maeshowe webcam in Orkney to see the rays of the winter solstice sunset entering the mound. Megalithic StudiesWonderful website containing helpful explanations of concepts in archaeoastronomy as well as photographs and diagrams of megalithic sites in mid-Wales and far across the world. Fascinating and educational. The peaceful death of Hamish Miller at his home near St Ives, Cornwall, prompted an enormous and appreciative response. The Parallel Community, which Hamish recently helped to found, enjoyed over 47,000 messages on its website, a warranted response to a man who had given so much to both the alternative and earth mysteries movement. Hamish was well loved. Hamish was always a Scot, but he was not always involved in alternative ideas. He spent his childhood near Stirling and attended Heriot Watt University in Edinburgh, where he graduated in engineering. After a career in this discipline, eventually owning his own company, he underwent a near-death experience (NDE) while under the surgeon’s knife, and this totally redirected his attentions to other matters that were to occupy the final thirty years of his life. He moved to a 12 acre smallholding near Trencrom, a short distance from Hayle and St Ives, where he set up a fully equipped blacksmith’s workshop/studio. He quickly made himself a local name as a fine and most useful craftsman, this leading to later acclaim as a sculptor in metal. Commissions followed and his garden was dotted with graceful and humorous examples of his work. It was in Cornwall, living under the powerful peak of Trencrom that Hamish first began to become interested in dowsing. He rapidly became very proficient indeed in this art, and in the late 80s, Hamish got together with another adopted Cornishman, the writer and historian Paul Broadhurst, and together they mounted one of the largest earth mysteries projects ever undertaken at the time. Travelling the length of what has since become known as the St Michael line – the longest line that can be drawn across southern Britain – they dowsed all the sites along it. Today the ‘Michael line’ is known to many people, at the time hardly anyone knew of it. 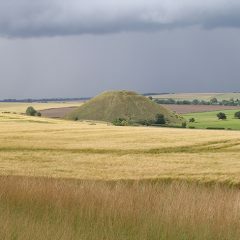 The Michael line passes through or adjacent to many of the prime sites in southern Britain and this includes many important megalithic sites such as Boscawen-un, the Hurlers and Avebury, as well as scores of churches named after the Saint, many perched on high tors and lower tumps, such as Glastonbury Abbey and Tor, Bury St Edmunds Abbey and Cathedral, Brentor and Burrow Mump. This lengthy quest resulted in the publication of the best selling earth mysteries book of all time, The Sun and the Serpent, in the late 1980s. Building on work undertaken previously by his contemporary, John Michell, this book radically and practically approached the study of the interaction between Man and Landscape, and formed a precursor to the phenomenology movement in academic archaeology. 1. The most commonly met error in landscape work is an assumption that the blue grid squares on an OS map align to the cardinal points of the compass. They do not. Drawing up North-South or East-West lines on Ordnance Survey maps requires that you refer to the longitude printed around the top and bottom edges of the map, (for East-West lines the latitude on the right and left edges) from which North-South and East-West lines may then accurately be drawn onto the map. Large scale maps emphasize this distortion to the level where most people think that Liverpool or Cardiff lie West of Edinburgh. They do not. establish the latitude and longitude (and altitude above mean sea level) often to within 20 feet, which is much better than can be achieved easily from maps. 3. OS grid references refer to an area square and not to a single point. Therefore it is better to set up the GPS to read degrees, minutes and decimal fractions of a degree. Set the internal set-up of the GPS to OSGB, to correlate OS maps to the GPS’s readings. With the display reading DD MM.DDD resolution down to 15 feet accuracy of a location is obtained. DD.MM.SS only resolves to a second, which is about 100 feet. Always record the elevation of a site. This often takes a few minutes to settle down on a GPS, but it makes issues with intervisibility between sites much easier to resolve if you recorded the elevation of each site and you are back at home 100 miles away! 4. If you use Google Earth, the indicated latitude and longitude will be slightly different from those on an OS map, and you will need to convert from WGS84 (Google’s) to OGB36 (OS). The website www.nearby.org.uk does this (and will also convert a grid reference to lat/long, with OSGB being displayed below the WGS84 reading). Google Earth is useful for indicating distances between sites although not always as accurately as do GPS readings taken on site. 5. Determining direction. The magnetic compass is best regarded only as a very rough guide to estimate direction in this type of work. The geology of Wales and Cornwall varies the compass reading, sometimes even reversing it! Much better is to use a GPS. To measure angles from a site, walk and peg a line of constant longitude (north-south) or latitude (east-west). Fix a cloth tape between the pegs, which realistically needs to be longer than a hundred feet. Use a large protractor to estimate other angles, for example to a prominent site on a distant horizon. 6. A theodolite is the ultimate tool for determining angles! Save the pennies and buy a secondhand one that does not invert the image. ISBN 978-0-9526151-0-1. Size 148 by 210 mm (6’’by 8.25”), soft covers, 184 page, full colour & fully illustrated (over 100 colour photographs and graphics). Published by Bluestone Press, Cardigan, Wales.